Redmax is one of those machines that is both tough and cool at the same time. The color lives up to the name - cherry red, and ready for action. These machines are built (and priced) for the serious homeowner or commercial operator in mind. The Redmax leaf blower has many innovative features that make is a good buy for the quality minded professional. 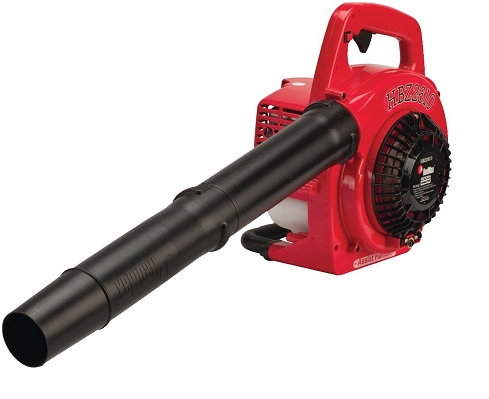 The Redmax Blower model HB280 represents one of the two models available that is a hand-held blower. Powered by a 28cc 2 stroke engine, this little pup develops 425 cubic feet per minute (CFM) airflow, with a nice 170 MPH velocity. The power output is rated at 1.1 hp, packaged in a frame that weighs just 9.4 lbs. The noise level is rated at 70 db. The commercial warranty is 90 days (almost a full cutting season), and the homeowner enjoys a 2 year warranty. Plan on spending about $200.00 for this nice little machine. The Redmax model EBZ5150 may be just right for you, if you want a little strato-charged fun during the day. The engine displacement is a quaint 25.4 cc 2 cycle, but don’t be fooled. The engine produces 1.2 hp, due to the greater efficiency and lower emissions. Air flow is a respectable 353 CFM, with a velocity of 124 MPH. The weight is 9.3 lbs, with a noise rating of 72 db. Both the commercial and homeowner warranty is 2 years. The price for all this power is a respectable $350.00. Now for the backpack blowers. Redmax blowers deliver a lot of power when they are mounted with straps. The smallest version offered is the model EBZ5150. Small is used with tongue planted in cheek, since the engine displacement is a healthy 50.2cc. The engine is the strato-charged design, and produces 487 CFM, with an air speed of 171 MPH. All of this power makes for a blower that is rated at 71 db. The weight increases to 22.7 lbs (hey, it is a backpack blower for a reason). The price is about $350.00. The Redmax leaf blower model EBZ8500 is the proverbial ‘king of the hill’ packing a 75.6 cc strato-charged 2 stroke engine that is able to move a whopping 907 CFM at an impressive 206 MPH. Heck, most race cars can’t go that fast! The weight is 24.6 lbs, with a noise rating of 77 db. A great 2 year warranty for commercial and homeowner users comes standard. The price is a healthy $560.00, but the power to blow even large stubborn mammals off the road is definitely worth it..
Redmax leaf blowers are exciting machines, with excellent features. The pros use these machines for a reason.